With more than 364 million users, LinkedIn has become a publishing platform of unprecedented magnitude for B2B communication. But with so many professionals—from HR head hunters to industry thought leaders—clamoring for attention, how do you ensure your message breaks through to reach the right people at the right time? Avid, the world’s leading provider of audio and video technology, has found the answer—though it’s no tightly held secret. In fact, any organization with a Company Page on LinkedIn can employ Targeted Status Updates to speak directly to specific segments within a larger following. By employing a smart segmentation strategy on LinkedIn—one focused on engagement rather than impressions—Avid has experienced exponential growth, resulting in 33,000 followers who are highly invested in its social activity. A few caveats: In order for this to work, you need at least 100 people in your targeted group. Also, any organic targeted post you publish will be visible to followers and LinkedIn members who visit your Company Page directly. The targeting only impacts which followers will have it pushed to their homepage feeds. The rest of the company’s LinkedIn followers are spread out over a variety of industries. Some updates, around branding and corporate history, are shared with all. But to ensure a healthy balance of content, Avid targets updates about product launches, feature updates and events to key groups. “When people feel that content is speaking directly to them, they’re more likely to take action, resulting in higher engagement and interest for your business,” Kranitz said. 60% of members are interested in industry insights. 53% of members are interested in company news. 43% of members are interested in new products and services. Simply put, LinkedIn isn’t where people go for casual conversation, so engagement can be lower than on some other platforms. That’s why targeting is so important. With LinkedIn members being well educated, highly skilled and competitively driven, content curators must deliver relevant information that either solves a business challenge or provides a career opportunity. Avid used the former tactic to help video editors tell a better story and, as a result, saw a spike in engagement. In targeting 5,829 followers by industry and job function, the company received 82 engagements on 4,166 impressions. Compare that with the same post on Facebook. The Facebook version was published worldwide (no language or geography filters) and received 118 engagements on 9,764 impressions. While more people saw the Facebook version—the natural corollary of having 158,000 Facebook Fans—the LinkedIn post was deemed more relevant. In all, Avid received 1.97% engagement on LinkedIn compared with 1.20% engagement on Facebook. Moreover, benchmarked against the average company update on LinkedIn, Avid’s targeted post was considered 365 times more engaging. 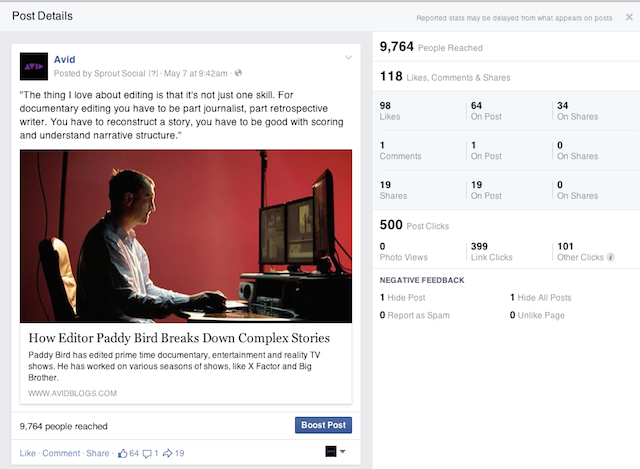 This higher engagement score speaks to more relevant, actionable content. People who clicked through to the article would see a quote from the featured editor, Paddy Bird, praising Avid’s Media Composer tool—a product endorsement intended to drive sales. LinkedIn’s use case is no longer singular. Updates are now being delivered by more than one department within fully integrated social companies. But be mindful: Marketing, sales and HR may be publishing Company Page updates that, without a diligent approach to segmentation, reach the wrong audiences at the wrong time. From a sales perspective, Targeted Status Updates certainly make sense. Broadcasting to all of your followers may be acceptable when you have a small product line or serve a niche market, but if you have hundreds of products or distinct customer segments, you don’t want to irritate your followers with hundreds of irrelevant updates. Gated content, for instance, is an invaluable resource for marketing and sales teams, but there’s not a lot of value in a marketing manager signing up for a white paper intended for chief information officers. For human resources, talking with industry peers and colleagues is very different from talking with customers. Your goal isn’t to sell a product but rather to recruit the best talent. Meanwhile, job seekers first and foremost want to learn about your company’s history, culture and employment opportunities. 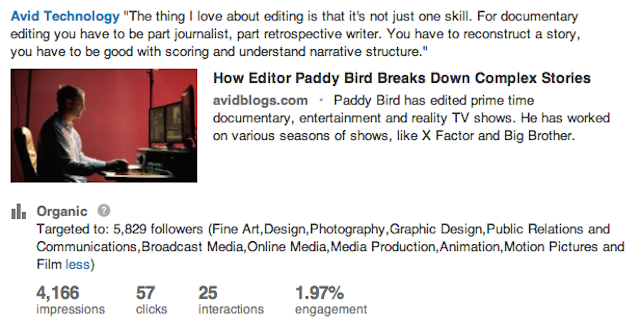 Discovering the different subsets within your following is key, and LinkedIn makes that easy. To see a breakdown of your followers, visit the analytics tab for your Company Page. There, you will find a demographic overview of your audience, broken down by seniority, industry, job function, company size and more. Whether you’re looking to network with people in your industry or find new business, Targeted Status Updates can help you get there. If you’re unsure about the benefits of targeting your updates, Kranitz recommends giving it a spin—after all, it’s completely free. Look at the targeting options, and ask yourself how you can make your messages hyper specific whenever possible, Kranitz advises. For instance, if you know that your targeting options are based around a CIO’s title, do an A/B test and focus your updates on just those individuals. Then, see how that impacts your click-through rate over time. “Watch if your engagement increases or decreases, because that’s ultimately going to determine whether targeting will be successful,” Kranitz said. What’s the best way for you to target your LinkedIn Company Page updates? 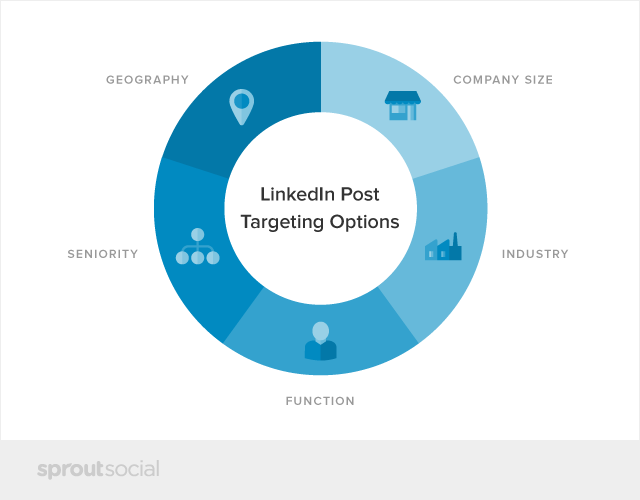 For specific use cases that will help you hone your segmentation strategy and align with your overall business objectives, download the LinkedIn Targeting Guide below.